What a handsome little family they are. And now... a few outtakes. 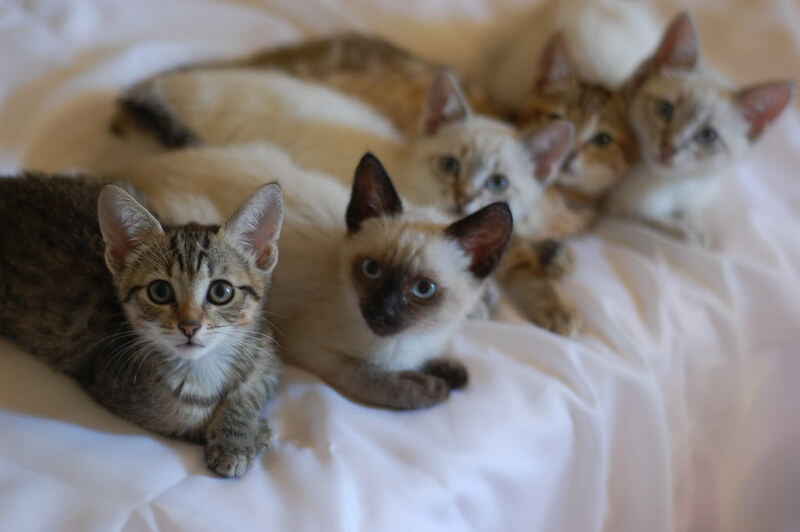 When you're snapping pics of a litter of kittens, it always takes at least a few, to capture the whole crew. There's always SOMEONE who doesn't want to cooperate. This time, it was Gaetano, our tiny little biscuit maker. He just needed someone to knead, and he wouldn't stop until he got his biscuit making fix. What an amazing mix! I'll say it again Laurie, how ever do you let them go? Fabulous set of outtakes... I really needed a smile today, and the Fortunato Five did it! These photos have really made my day! I'll make biscuits with you cuties any time! I'm more than willing to be made into biscuits! Oh they are so cute - I love the one where it looks like Gaetano is pushing Pippy over and she is all like "hey I am here" and then the one after where he is looking at the camera like "I am not finished yet so back off". OMG the eyes, the eyes, the eyes have it! Well, the WINNERS who named these babies are just that: WINNERS! These are spectacular....Laurie, you must spend a good part of every day just LAUGHING (I know *I* do). I was just away from home for 12 days and your babies provided my kittyfix until I could get back to my own. i see a future in an Italian bakery for Gateano. Little chef's pouf hat, apron covered in flour. Okay, I wish could take them all. How much fun would that be? Tons! But Kate would kill me and our four boys would be VERY put-out, having a new influx of competition. How do you get them to all line up like that? I only have one kitten and I can't get her to hold still for 2 seconds unless she's asleep. The Fortunato family are so darling! What a cutie Gaetano is. Love this set of shots! Really made my morning. I am in love with Gaetano! Does he nuzzle too? I know a lot of kitties that are biscuit makers are nuzzlers too - he seems like such a sweet boy! LOL! Just what I needed for a Monday morning! Laurie, you definitely have a market for out takes... I love the perfectly posed portraits, but the out takes are priceless! Fortunatos - but it is the outtakes that tickle my funnybone. Gaetano is just like Goldielocks! He just tries each sibling out until he finds the one that's "just right" for his kneading needs. I love the outtakes! I would love to know more about how you get such great pictures. What is your ratio of total pictures taken to useable pictures? I have two kittens and I end up with a lot of shots of "where the cat was" or the tip of a tail or the back of a head! Now I have that song stuck in my head....THANK YOU!!! Sweet Gaetano is such a kneady boy. Is his voice siamese-y? It looks like he gave you a what-for for interrupting his zen moment. I volunteer to come lay on the floor and "suffer" their explorations. i am in love with Gaetano and his biscut making. it is too much. he was not going to stop until someone let him knead them! TOO CUTE! 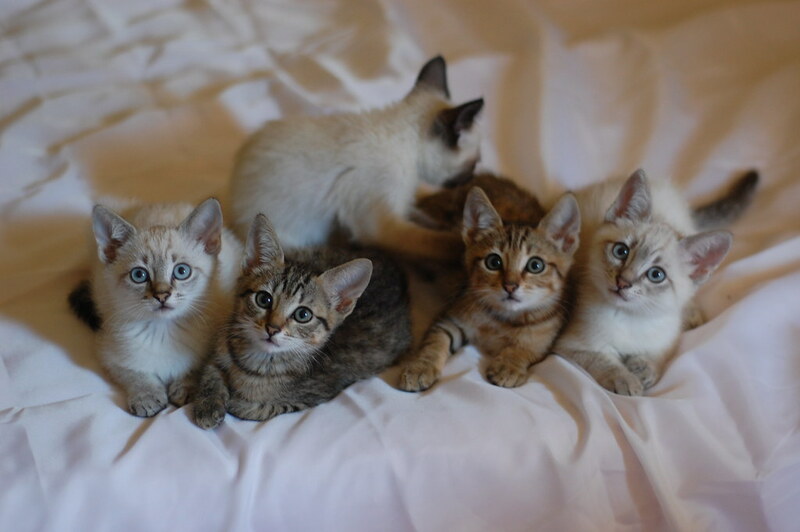 Oh dear, I love the little tabby faces! 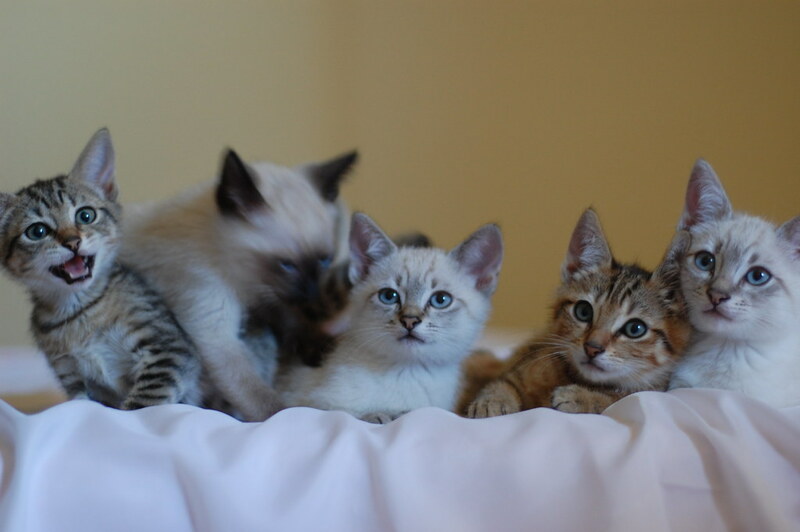 Thanks for the kitten photographs, Laurie. Can't wait to see CB feasting on them! If you ever need me to come across the country and snuggle them all when you need a break, just let me know. What does it say about me that I love the outtakes the best? Yes, I'm all about the cute-chaos. As the human of a compulsive biscuit maker marmie boy - who also insists on sucking on his blanket WHILE making biscuits, I will attest that when the biscuit fever strikes, nothing, and I mean nothing can stop the kneading. It's a powahful force. The outtakes were awesome. Can we get more of those? 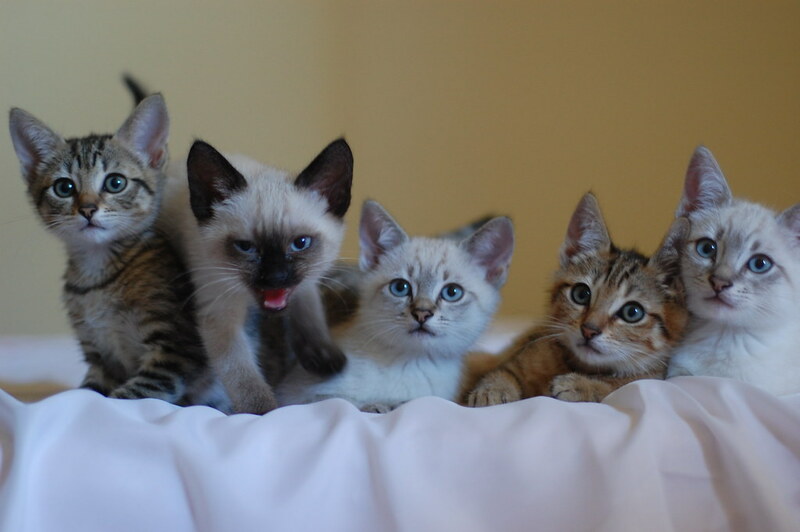 I love the first outtake shot, where all the kittens look like they're saying, "Come on, Gaetano, sit down already. D:"
I had to show this set to my husband. He said Gaetano looks like he's trying to find the milk bar. He surely does remind me of when our babies were small and would nuzzle and knead on each other sometimes instead of Emdee. ctb18... i couldn't tell you exactly what the ratio is. sometimes you get lucky and nail it on the first one... sometimes it takes dozens. have your camera out and ready to shoot. 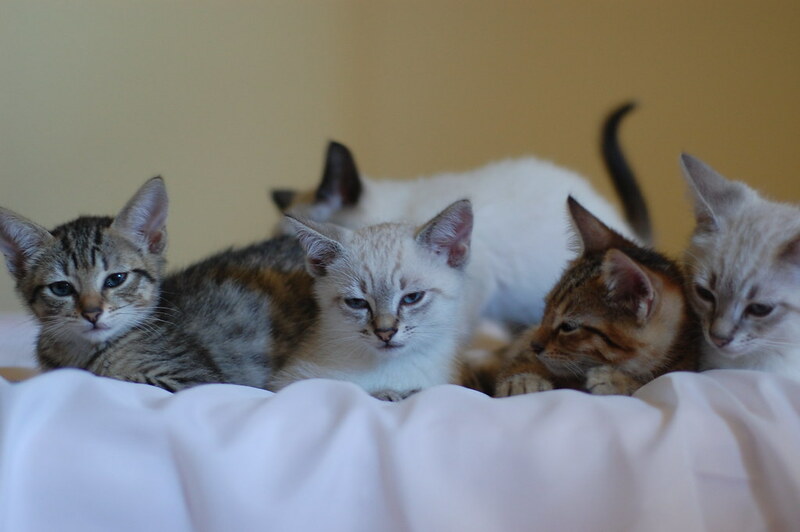 when your kitties are in a mellow state, try taking pictures then. timing is everything. That last pic - they all look like they're saying, "see Mom, we're good, we're very good" While Gaetano is being the mad biscuit maker! Thank you Laurie- those made my day. Our family cat, Jordan, passed away yesterday after 16 years of being loved and I needed a smile. 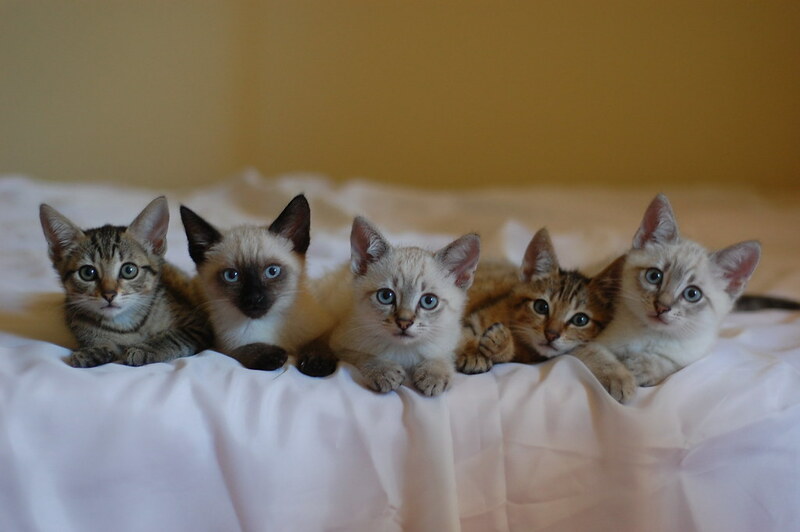 this is such a cute litter! 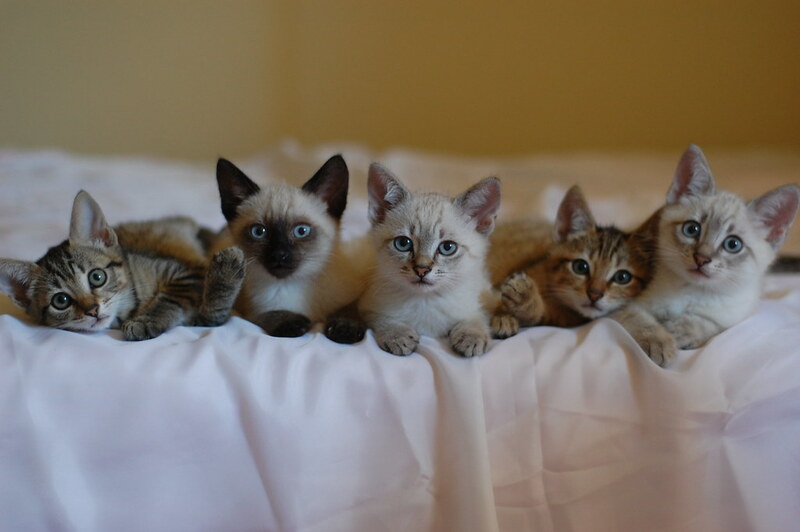 everytime you get a new batch, i think oh, they won't be as cute as the last family, but they always are! As the namer thereof, I'd like to point out what a good boy Dominick is. Look how nicely he is sitting. What a sweet boy! yes, eleanor,, your boy remained perfectly poised like the little saint he is! 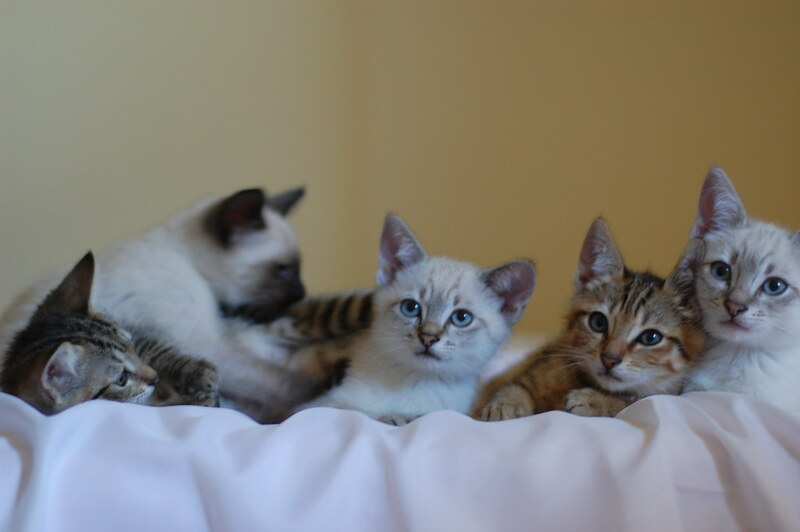 Are these kittens from perhaps two litters? Or have tabbies and points somehow come from the same mother?